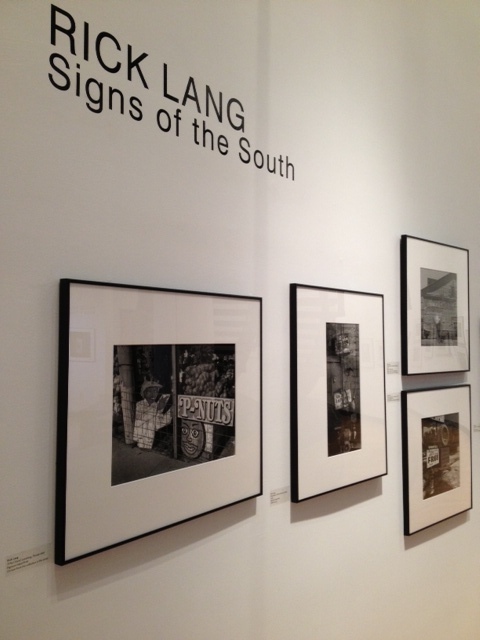 As of this writing I am participating in an exhibition at the Southeast Museum of Photography, which is something that I am most proud of. Over the years I have been very fortunate to be able to show my work in some very fine galleries and museums. Talking about the show with my friend and mentor, Bob Lerner, I was reminded of a story about a show that I was in some 25 years ago. I think that it played an important role in some of my attitudes about the vagaries of putting your work in public. While I was still attending Daytona Sate College, I was asked to participate in an exhibition of photography that was to feature large number local photographers at the Orlando Library. I thought this was a truly important opportunity, which I jumped at. It was for me a validation of my entry to the fine art photography community of Central Florida. Telling one of my teachers about the show, he suggested that I ask the organizers if they would be interested in his work as well, which they were. I turned in my work on time, showing what I thought to be my best offerings and then waited for the opening. A group of us went to the opening and when we first walked into the door in a very prime place was the teacher’s work that I had suggested. The rest of the show was spread out over the entire library, which is quite large. Looking around, I could not fine my work and was beginning to wonder if they had decided not to hang the work. Then one of my fellow students said that he found where I my work was hanging and we all went to see. It turned out that my photographs was hung in an office, that at the time of the opening was locked and could only be seen in the darkness through the window in the door. I looked at the door and it said that it was where books on tape were kept. Unlike today, books on tape at that time were mostly checked out to the visually impaired, which meant that most of those who came to the office most likely could not see my photographs. I was struck with the irony and to some extent the surreal quality of the how my work was being presented, but rather than get angry, I found it amusing. I think that almost every artist who shows their work will have one or more stories like this. It value, at least for me, is to remind me that my work is not always going to be placed in what I might think the best and appropriate spot. It keeps one humble and that can be a good thing. Almost 30 years ago now I picked up a biography about Alfred Stieglitz by Sue Davidson Lowe. This was an important book for me, and over the years I have read it several times. 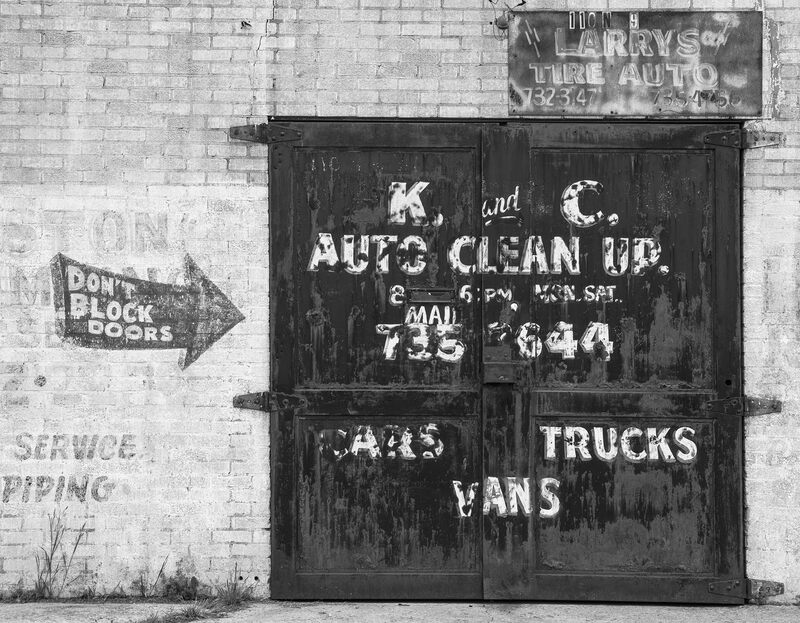 It was at the beginning of my career and an introduction to a pivotal time in photographic history. Being a pure force of nature, Stieglitz moved photography from the 19th to the 20th Century. However, the idea that I kept coming back to time and time again as I read the book was the photographic and artistic community that Stieglitz surrounded himself with. The group of artists that surrounded him feed off each other and I believe that anyone of them would not be as well known without the association of the others. What I am sure is more important is that there was the opportunity for an exchange of ideas that influenced their work in a positive way. Ansel Adams and Edward Weston had Group 64, and Hemmingway had the ex-patriot writers in Paris, there are many more examples of these types of supporting communities. Nothing is created in a vacuum. 25 years ago I was attracted to Crealde School of Art because I found an artistic community within the school that was giving and supportive of this neophyte that imposed himself on them. It was very important in my development as a photographer to not only have available the Photography Faculty, but also those in all the medias studied at Crealde. I would often show my work to the Creamics Teachers to get their perspective. I owe them all a great deal. Recently however, I learned that my artistic community is even more important than the role they played in my personal growth as an artist. During a recent trip I became very ill and was just able to make it home before spending about 3 weeks in the hospital. While I knew that a few would come by to see me as I recover, I was overwhelmed with the responce of many people at the school who brought me several hours of uplifting joy by coming to see me. While in the hospital I felt detached and unconnected with photography, art and in turn life and frankly it left a hole in my soul. The visits by my artist friends began the process to fill that hole. This is an example of an artistic community at its best and I am most grateful. A few years back I bought a van, and when I went to sign the contract I had to wait for the salesman for a few moments. After a short time he comes up and says that he was sorry to keep me waiting, but he had to put out the balloons. I asked him if he thought that the balloons ever really helped him sell a car. He leaned over and said softly so no one else could here, “It does not matter what I think, Mr. Dance (the owner of the dealership) thinks so.” Driving by this rooster made me think of how a business will put out anything in front of a business in hopes to attract customers. 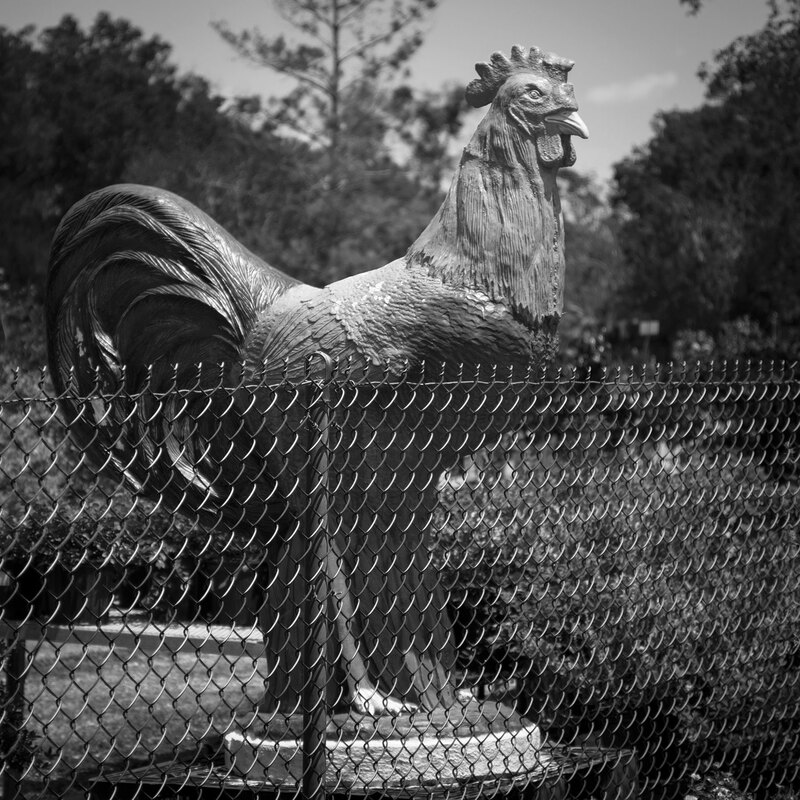 I do have to say that I enjoyed driving by this rooster more than those King Kong size blow up apes! There is a quote by Aristotle that says, “Youth is easily deceived because it is quick to hope.” I feel that youth is deceived because it believes that youth will last forever. Becoming older does not change this delusion; rather makes one try to chase it. Throughout history there were tales of some fountain where one could have youth restored to an otherwise aging body. There is a story that Ponce de Leon was chasing that dream when he came to Florida in 1511. 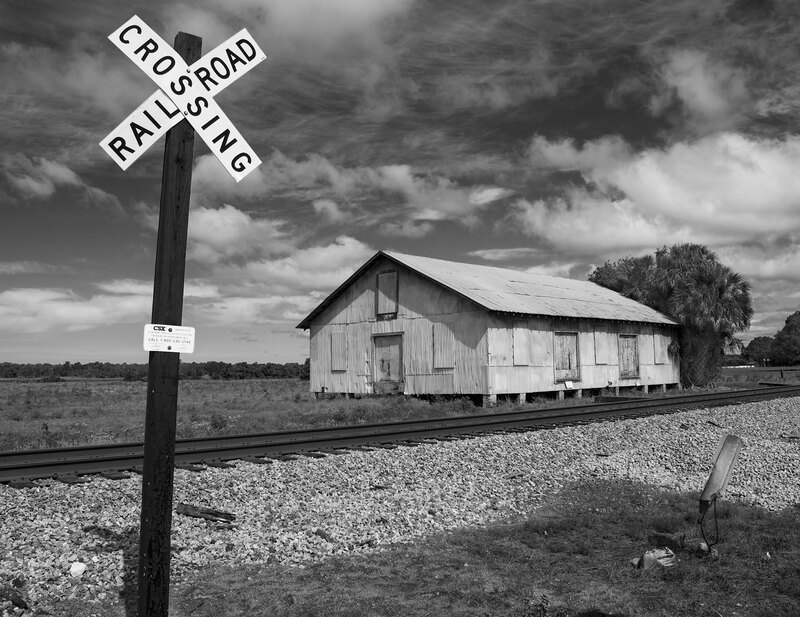 The story is not true, or at the very least, there is no record directly attributed to de Leon where he mentions it, but it has worked its way into the lore of Florida history. It is funny to me that there are several “documented” locations for the Fountain of Youth throughout the state, when the story goes that he never actually found the fabled spring. Over the past couple of years I have photographed five different locations that try to attach Ponce de Leon to the myth of the Fountain of Youth. Each has its own historical marker that “proves” the fact that de Leon actually found the spring of healing waters at that particular location. The truth is that he did not find, nor did he even look for the fountain. Fact or fiction has never been a bother to Florida when it comes to an opportunity to attract northern tourist to the state. Beginning in 1511, Florida has treated visitors to its wonders, both actual and those made up. In the advertising world this is referred to as “ballyhoo” and from the landing of Pomce de Leon to Disney the state has been steeped in it. Please do not get me wrong I am not criticizing, for me it is very much part of the charm of the state, and it is part of who we are. I just find it humorous that there are so many locations for something that was never found. The picture at the top is for De Leon Springs State Park, where Ponce de Leon has become a marketing tool. The bus stop add for a laundromat shows the 16th century explorer holding up a pair of boxers, that most likely did not exists in de Leon’s day. The entrance to the state park bearing his name show him with his arm around a young lady in a 20th century styled bathing suite. In the end the ballyhoo is a fun aspect of the history of Florida and how sometimes myths work themselves into an accepted part of history. It is interesting to me that Florida has had to resort to ballyhoo to create its allure when the weather, lovely natural landscape, and friendly people should be enough. As you may remember, I was scheduled to travel to western Tennessee for a two-week photographic trip last May that was supported in part by a Professional Development Grant from United Arts of Central Florida. Sidelined by illness, I was unable to go then, but I am making the trip this May, from the 17th through the 26th. I will be blogging about my travels under the heading of the Memphis page. I will take a little break from the main page while on my trip. I hope that you will join me on the Memphis page. Each day I will make an entry on the Memphis page from the road that includes photographs on my Flickr site. (Link to the right) The blog will include stories, insights, and bits of the history and culture of the region. In addition to Memphis, I will be traveling to Dyees Arkansas, home town of Johnny Cash, to see this community that began by a Depression era government program. I will also spend time in the areas around Jackson Tennessee. Right now I am do many things to get ready, including research, looking over maps and making a tentative itinerary of the areas that I want to explore. I hope that you can join me on my travels! To see the blog on my travels go to the Memphis page beginning on the evening of May 17th. The photograph above is from a trip to central Tennessee that I made in 1999. The sign for Cardui must have been there for some time, as while it has helped women for 50 years, I doubt that it has been on the market for the past 70 years. Cardui was an exlixir for women that I understand was mostly alchohol. Spring is always a favorite time of year for me. There is such a sense of renewal at this time of year. The grass is getting green, and the wild flowers on the side of the road are carpeting the landscape in color. Spring is a time where possibilities are abundant. April is the beginning of baseball season, when my favorite team can still go all the way. As a photographer, this is the time of year when the light is best, and along with the prospect of traveling; I look forward to getting out and seeing what there is to see. However, what I like to see most is the beginning of baseball. Each year I look towards my hometown team, the Los Angeles Dodgers, and see them making the drive to the World Series. Most years I have been disappointed, but that has never dampened my hopes. Spring fosters hope eternal. My first memories of the sport of baseball came in 1958, when I was a very small child. The city had not yet built Dodger Stadium, and the team, who had just left the Brooklyn, was playing in the LA Coliseum. They had some great players, though some of them were at the end of their careers. Pee Wee Reese was still playing shortstop, along with Duke Snider, Gill Hodges and they had a great pitching staff, including, a young Don Drysdale, Sandy Koufax and the vertern, Don Newcombe. It was Pee Wee Reese however, that caught my four-year old notice. For me at that age, to see someone named Pee Wee cemented my first connection to the sport. Later, after moving to Florida, and after Pee Wee’s playing days I would watch him every Saturday afternoon on the NBC Game of the Week, where he did color commentary along with Hall of Famer, Dizzy Dean. Some years later, I was watching my college team play a game, when I noticed an older gentleman sitting next to me who looked vaguely familiar. I asked him if he was Pee Wee Reese, to which he replied, “Son you’re not old enough to know who I am!” He was not being hard to get along with, but just surprised that some kid in the stands would know who he was and recognized him. I told him that my earliest memories was watching him play that first year that the Dodgers played in LA. Several years later, having just graduated from the Southeast Center for Photographic Studies, I was hired to provide some still photos for public services commercials that Major League Baseball were making here in Orlando in 1989. 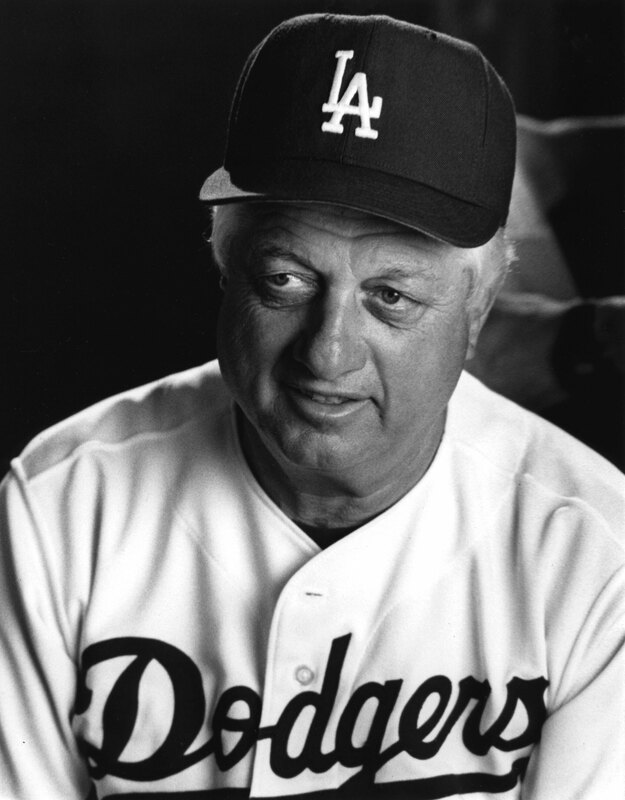 It was then I had the opportunity to photograph the famed, Dodger manager, Tommy Lasorda. The main photos that I took of him were in a locker-room where they filmed the commercials. While he was very friendly and professional in what he was asked to do, it seemed to me that he did not suffer fools gladly. The director set up a scene where Lasorda was to storm out of the dugout to argue with the umpire. The director was giving Lasorda instructions about how he was to do the scene, when Lasorda stopped him and said, “I know how to argue with an umpire!” With the camera rolling he runs out of the dugout and argues with the actor who had the misfortune of playing the umpire. The director yells cut and Lasorda, turns to the actor and calmly tells the him that he did a great job. I am not sure how much of those comments were heard by the actor, who had not yet recovered from the tirade that Lasorda gave him just a moment before. Lasorda then smiled, patted the actor on the back and returned to the shade of the dugout. I think that Lasorda showed the director that there were some of the acting arts even in baseball. 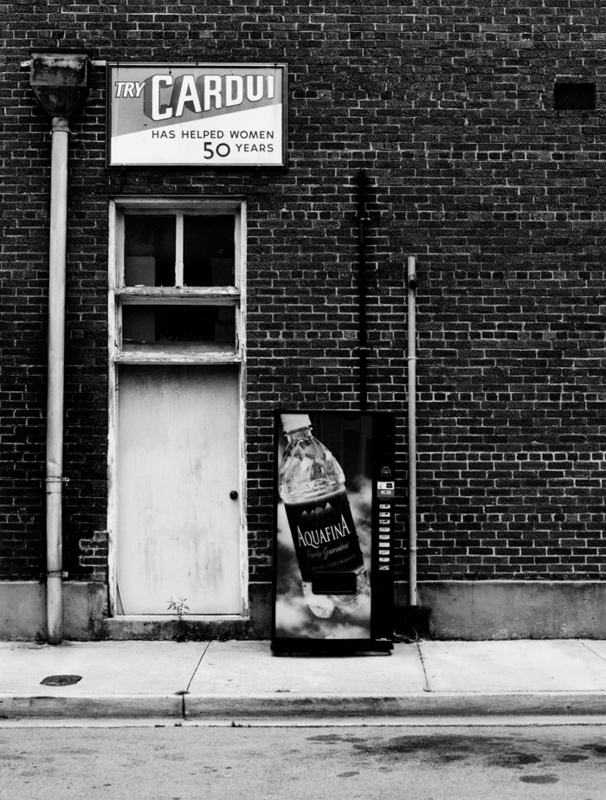 The truly great thing about photography for me is how my interests in photography is supported by my other interests, whether it be baseball or to see what I can find along the side of the road.